NPOs are voluntary organisations, which means that they are established at the initiative of individuals, and not as a result of the passing of some law, or a decision of government or a parastatal corporation. NPOs exist to address a social need or to advance a purpose in the public interest. NPOs are barred from pursuing self-interest or private profit, and must apply all their resources to advance a purpose for public benefit. NPOs may be established simple by the act of agreement between three or more people as a voluntary association. If an NPO is dissolved, any remaining assets must be transferred to some other NPO having the same, or a similar, purpose. NPOs are, by nature, committed to a number of values and principles that are different to those which are applicable to the commercial sector. The primary difference of purpose is that an NPO exists solely to serve the common good, and promote a public benefit, rather than to achieve individual profit or advance self-interest, which is the normal purpose of a for-profit entity. 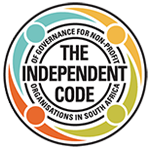 Reference: The Independent Code of Governance for Non-profit Organisations in South Africa. Considering starting an NPO? This decision tree might help you clarify your next steps.